Generosity comes in many forms. However you wish to support Indiana University of Pennsylvania, your gift to IUP ensures that students will continue to benefit from the intimate, learning-centered environment we foster in all our classrooms. In partnership with you, we can provide tomorrow’s leaders and innovators with a world-class education today. Start here and learn about the different ways you can support IUP. We will work with you to find the best match for your family’s needs and the impact you wish to make at IUP. When you philanthropically invest in IUP, IUP becomes the fiduciary and steward of your gift. 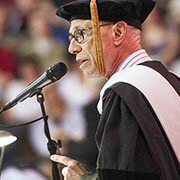 IUP is a partner in facilitating the university’s goals and promoting a superior student experience. For more information, contact blauber@iup.edu, executive director, at 724-357-3184. As you explore your options and decide you might want to make an immediate gift, please visit www.iup.edu/giveagift. Don Mash ’64 believes that supporting IUP is essential to leveling the playing field and keeping the opportunities that a college education provides within reach of students and families today.